Those who are involved in sports management are, by definition, leaders. In order to do their jobs effectively, leaders must possess specific skill sets – regardless of the specific industries they might be involved in. Sports management jobs are no different. Your resume serves as your personal sales brochure. Its purpose is to demonstrate to a prospective employer that you are the ideal candidate for this position. Because it is your first point of contact with an employer, it is imperative that your resume make a positive first impression. It must be clear, concise, and demand the reader’s attention. Instead of being a generalized summary of your work history, your resume needs to be specifically tailored to the position and organization you are applying for. For example, a sports manager who works with individual players in the NFL will have a different set of duties than a sports manager who works with the Olympic Committee. Your resume must demonstrate how your best qualifications and talents align with the position’s specific job requirements. A resume should speak directly to the job you are applying for, address the position’s criteria, and be relevant to the position. There are two primary types of resume formats in the business: chronological and functional. Of the two, the chronological format tends to be the most popular. It generally includes an objective statement, includes educational information (including certifications and special skills), and a detailed, chronological listing of all of your past employers. While there is nothing specifically wrong with this particular format, it can be detrimental to those who are just starting out in the sports industry. The sports industry hires based upon skill – not GPAs or extracurricular activities. For this reason, an increasing number of graduates are choosing to employ the functional resume format. A functional resume will highlight your specific abilities, like coaching or organizational skills, instead of your chronological work history. You will still summarize your work history; however, it will generally be done at the bottom of the page. By the time a potential employer reaches it, they are sold on your skills. The sports industry is a result oriented business. Demonstrating how your talent can result in results will pique an employer’s interest. For a hiring manager, interviewing 50 candidates for a single position will become repetitive and boring. Reading the same clichés over and over again can, and will, put them to sleep. “I’m willing to do whatever it takes” and “I just want to work hard” become so monotonous. At the same time, the sports industry places a heavy emphasis on experience. This is why internships and work experience in sports related fields is so important. In order to distinguish yourself from the other candidates, and to best highlight your relevant work experience, the phrases you use need to start with strong action verbs in order to grab the reader’s attention. On your resume, you have a limited amount of real estate, and generally, you have less than a minute to make a strong first impression. By using dynamic, powerful verbs, you can describe your relevant experience specifically and in fewer words. When possible, you should ditch generic passive verbs like “worked” or “did”. These general resume tips may be thought of as “standard” information; however, you would be remiss to neglect to pay attention to them. 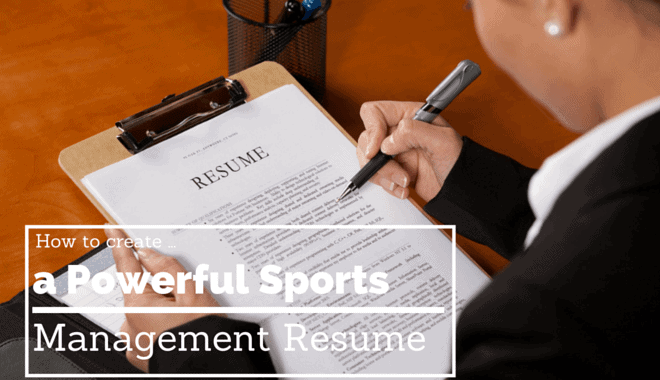 It will not stand you in good stead to invest time into crafting the perfect sports management tailored resume if you have multiple spelling mistakes or incorrect contact information on your resume. Bear in mind that the average hiring manager will scan your resume for only one minute – or less. Make it count. Never lie on your resume. Be honest throughout. Do not use a resume template or table to create your resume. Resumes should be typed in 11 or 12-point text, and only use Times New Roman or Arial fonts. Recent graduates should limit their resume to one page only. To highlight important information, use indentations, bolded words, and bullet points. Never include references or the statement “References are available upon request” in your resume. Personal information, like your age, marital status, or hobbies, should never be included. Your resume should always be accompanied by a cover letter. Finally, after you have finished your resume, proofread, proofread, proofread. Use your alma mater’s Career Services staff to edit and proofread your resume.